In the mid-1960s with the modernisation plan 10 years old and the end of steam in sight, the nettle was grasped to re-design BR as well as re-shape it. First, in 1964, the name itself was shortened - to British Rail. A contraction which gave plenty of scope to the comics at the height of the Beeching closures. Then a year later a new corporate identity was unveiled. The emphasis was on uniformity, with the aim of producing a railway that looked the same from Thurso to Penzance. A railway that would be immediately identifiable to the customer wherever they might be. In came the now internationally famous 'barbed wire' double arrow symbol and the distinctive rail alphabet, both being used on a new range of black on white signs which replaced the old Regional colours. There were new standard liveries too, dampening down the flames of Regional autonomy even further. All locomotives were rail blue, main line carriages were rail blue and grey, while suburban stock was rail blue only. The break with the days of steam was total. Here at the beginning of the 1970s the corporate identity express rolls through Marsh Lane Cutting outside Leeds. Appropriately it is hauled by one of the 512 Class 47 diesel-electrics, the most numerous type of main line diesel on BR and to be seen almost everywhere from Inverness to Penzance, Fishguard to Norwich. It is painted overall in rail blue relieved only by the garish yellow full frontal applied at trade union request to make the silent new motive power more obvious at a distance to men working on the track. Behind No. 1505 (which a decade later became No. 47406 Rail Riders, the mascot of BR's children's club) is a train of Mark 11 carriages. Introduced in 1965 they were excellent vehicles, the first design to incorporate integral construction of body and underframe, and represented a far greater advance in carriage design than the Mark I coaches of the 1950s had. 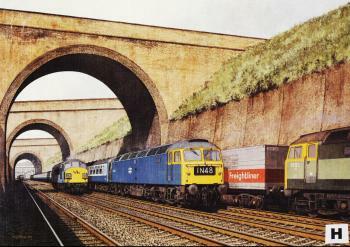 The as yet unrepainted Class 47 on the right is hauling a Freightliner train. The development of containers carried by rail for the long haul and road for local collection and delivery was one of the major planks of the Beeching Report's re-organisation of BR's freight business. In 1982 British Rail was divided into five business sectors - InterCity, Railfreight, Parcels, Provincial and London & South East (later Network South East). Each Sector having bottom line financial responsibility for its performance throughout the country regardless of Regional boundaries. One of the first visible signs of the new Sectors' identities was the rapid appearance of a colourful livery for each of them. Suddenly the railway didn't look exactly the same from one end of the country to the other any more.